The Luxe Sport collection designed by renowed fashion designer Rachel Zoe for Quinny is a luxurious take on the sporty Zapp Flex Plus. Classic black and white fabric, with netted accents that provide a sporty yet chic look, pop against a champagne colored frame. 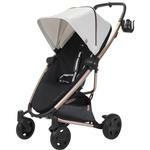 A black, white and champagne pinstripe completes the look with glam detailing, allowing parents to walk their way in style.